To The Cordish Company and the Casino Reinvestment Development Authority for creating a vibrant retail, dining, and entertainment district that serves as a walkable connection between the Atlantic City Convention Center, NJ TRANSIT rail station, and the Boardwalk. When the Atlantic City Convention Center was built a decade ago, it was almost a stand-alone building in a desolate section of the city. The “Miss America Rose Walk” along Michigan Avenue – lined with commemorative bronze plaques telling Miss America Pageant stories – from the Convention Center to the Boardwalk was barren and uninviting. Yet Michigan Avenue, which connects the Convention Center and NJ TRANSIT rail station to the Atlantic City Boardwalk and the casinos, remained an important urban thoroughfare whose attributes could not be ignored. With thousands of people each year visiting the city’s Convention Center, hotels, boardwalk, and casinos, it was an obvious spot for a revitalized shopping district. The Casino Reinvestment Development Authority (CRDA) immediately understood the neighborhood’s potential, and shortly after the Convention Center was complete, they began plans to redevelop the area. CRDA, established by the State of New Jersey in 1984, works to encourage investment in projects that improve blighted or redevelopment areas in Atlantic City through encouragement and financing of new capital investment and economic development in the city. CRDA took the first step by acquiring all of the properties along the blocks from Mississippi Avenue to Ohio Avenue and from the beach thoroughfare to the ocean. After making an initial $31 million investment, CRDA partnered with the Cordish Company, and the developer transformed the neighborhood with Atlantic City Outlets, The Walk. The Walk is a 41-store shopping area spanning the length of Michigan Avenue between the Convention Center and the Boardwalk. As a result of the project, the city’s annual visitors – including 35 million gamblers and conventioneers who have long complained about the lack of non-gaming attractions – now have someplace to go. Persuading retailers to roll the dice on Atlantic City was not easy. Some doubted the viability of the market, which is dominated by day-tripping senior citizens and slot machine players who typically stay only a few hours when they come. Others worried about security and crime. But the project partners worked hard to convince them of Atlantic City’s appeal, citing the sheer numbers of annual visitors to the city. 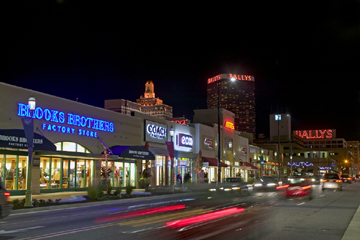 The proximity of The Walk to the NJTRANSIT rail station, the entrance ramp to the Atlantic City Expressway, the Convention Center, and the city’s most prominent non-casino hotel gave the project the necessary vehicular and pedestrian traffic to create a winning situation, not just for the project itself, but for nearby businesses and services. The 320,000-square-foot complex encompasses eight city blocks and features factory outlets, entertainment, and restaurants along with plazas, fountains, and kiosks that enhance the pedestrian environment. The project has added approximately 1,200 permanent new jobs for city residents and by drawing pedestrian traffic to the area has dramatically enhanced the city’s economic development. Cordish and CRDA are also currently researching the viability of a residential component to this project, to be included in Phase II.